A shortwave radio is a receiver specially designed to pick up frequencies outside the standard AM and FM radio frequencies. These radios work on frequencies from three to 30 MHz. One of the most notable aspects of these frequencies is that a radio can pick them up for very long distances and they can even be used for international communication. The primary benefit of shortwave radio is that you can listen to international radio stations, many of which broadcast in English. This would be helpful during an apocalyptic event as it will be the easiest and most reliable way to get information when standard lines of communication are down. The radio can also pick up local signals so if anyone is broadcasting locally, you can get information that way as well. These radio receivers can also pick up non-shortwave signals, such as ham radio, maritime signals, news broadcasts, aircraft communications, and much more. The primary problem with shortwave radio is that the signal can be inconsistent. The strength of a radio signal may vary depending on factors such as what time it is, the weather, and distance. In some cases, you may find that you are able to hear a broadcast crystal-clear one minute and barely detectable the next. In order to get the best and most effective shortwave radio for you, you will need to determine how much you are willing to spend and what you are looking for in a radio. For example, you may want to limit your search to models with more than one frequency mode. Most of these radios come with AM, but if you get a model with SSB mode, you can also monitor military, maritime, ham, and aeronautical radio. This may come in handy as you never know who will be broadcasting and where during the apocalypse. You may also want to make sure that your radio comes with a jack for an external antenna. Most radios come with a built-in antenna, but an external antenna will boost the radio’s receiving strength, making different broadcasts easier to hear and detect in an emergency situation. Another consideration is how you plan to power the radio. Some radios run on batteries, some on AC current, and some on both. Of course, the best option is getting a radio that runs on both so you can use it even if your electricity is out. Just make sure to keep plenty of batteries nearby. It is also a good idea to find a radio that offers squelch, filter and scanner options. The squelch option allows you to get rid of static, making it easier to find stations. The filter option allows you to filter bandwidth outside of a certain range, which also makes it easier to find stations. The scanner will help you search all of the stations to find those with the strongest signals. Radios with shortwave capabilities are very easy to find. Once you decide on the features and type of radio you want, you can go to most electronic stores or hardware stores and find a good selection. The best way to find exactly what you want may be to buy online. Plenty of websites, such as amazon.com, have a large selection of radios complete with reviews from users. 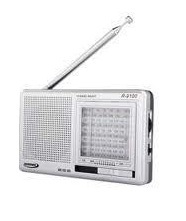 Depending on the features and quality you are looking for, radios with shortwave capabilities range from approximately $30 to over $150 for those that are top of the line. Radio antennas, which are optional but very helpful, range from around $10 to over $70 depending on quality. A shortwave radio is a great investment and a helpful item to have for any emergency or apocalyptic event. It will allow you to hear radio broadcasts from around the world and will let you pick up on helpful frequencies such as military or maritime which may provide helpful information in an emergency.